Many landholders know all too well, the truth is – you can ‘plan’ all you like …. BUT… in the case of planting en masse, it is innocent rain drops that will flick plans into action. So while we wait to for a decent rain event to plant another three biodiversity plots in the dieback area this Autumn, we can update you on what we have done to date. Each of our existing 12 biodiversity plots are showing varying degrees of success (see graph below). We have set up smaller sub plots to monitor tree survival and growth rates without having to traipse across the whole area. Most of the species that we have planted (see pie chart) are doing well..
We have passed a clever drone across each plot to capture baseline images that we can look back on in years to come. We have submitted numerous funding applications with fingers crossed. Furthermore, Upper Snowy Landcare Network along with its many on-ground partners and collaborators such as Greening Australia, Monaro Native Tree Nursery, University scientists and Local Land Services have not given up on the need to put our green thumbs on the cause of tree dieback on the Monaro. We hope to inform you of our research ideas when we receive a reply from government grant providers. Shane Trengove the USLN Chair says, “Our network of volunteers is very committed to restoring some biodiversity into the dieback void and to encourage landholders to do the same if they can. We are also always looking about for answers, such as, has dieback slowed or stopped; is it moving into other tree species; what actually caused it in the first place? These are big questions and you can imagine how grateful we will be to receive government research support”. 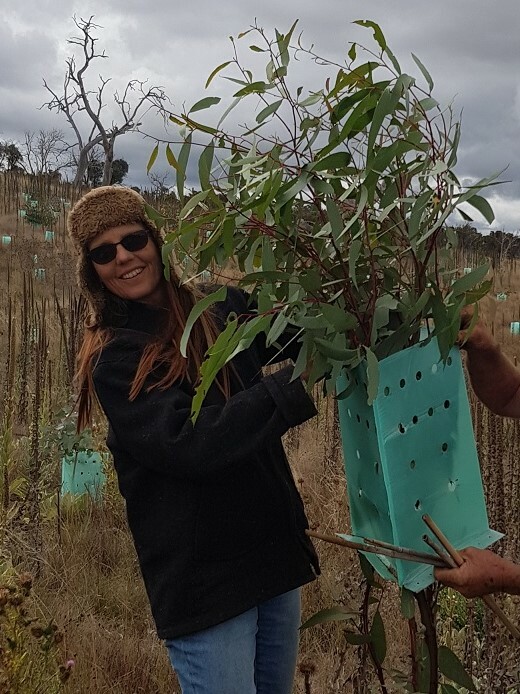 With more than 2000 sq kms affected by dieback on the Monaro, the 12 biodiversity plots put in by Upper Snowy Landcare are a small but important gesture to restore lost habitat. However, Greening Australia’s Environmental Trust Bush Connect project is approaching the dieback response a little differently by testing survival and growth of different provenances of Eucalyptus viminalis (ribbon gum) using seed collected from a wide range of locations (including from warmer and drier regions of Australia). GA will commence planting these unique seedlings this year in trial plots within the dieback area on the Monaro. Captions: Time to lift off a tree guard or two; the survival rates so far as a function of time; and a pie showing the composition of species that we have planted.